2016 03 11 Give us a kiss!! With the River Nene flooding the surrounding fields are completely under deep water. In these fields are some horses which we all think belong to the gypsies. There has been a huge outcry on the local Face Book page in trying to get the horses moved out of the waterlogged fields. RSPCA and the local vets have been involved - not very successfully I have to add!! At about 1.30am this morning a group of concerned local people were down by the field putting straw into a small corner of the field just out of the water. They have been feeding the horses. This morning it was in the local newspaper and on the BBC local news. Finally three horses which were still in the centre of the field standing in water were rescued and taken to a nearby farm. There are just three horses left on the raised corner of the field and I went to see them with some apples. This stallion was so pleased to see me I think he wanted to give me a kiss. Absolutely heartbreaking to see horses being treated so badly but wonderful to know there are lots of people who are fighting for them!! You can see part of the flooded field behind the horse. Lovely shot Pam. So kind of you to take them some apples. Am I correct that you are (were) scared of horses? Nice shot! It's good that they're getting rescued. Great point of view . Not sure what to say that would be politically correct, regretfully we are getting dead horses dumped in a land near us which had been traced to a certain community . Response until caught in the act nothing can be done!! @salza Yes Sally I am petrified of horses!! I was trying to take some photos and he kept putting his face nearer and nearer to mine!! At least there was a fence between us. I think if anyone had been watching me throw the apples over to the horses would have laughed!! What a wuss I am!! @pamknowler well I must fav for your bravery at getting this close. I have been unable to go horse riding recently and I am suffering withdrawal symptoms so seeing this beautiful squishy nose helps! @padlock Everyone seems to be angry at the RSPCA's lack of response but I think they have a very difficult job and their hands are tied. So sad though!! What a fabulous POV. I love it. It has me giggling! Great shot Pam - Fav I had the same experience with a horse in the field down Wood Lane on Christmas Day a couple of years ago and I phoned the RSPCA for help. Fabulous shot and yet such a sad tale. Hope he is moved to safety. Wonderful POV on this charmer... hope he (and his friends) get moved to safety. So sad to hear of these animals being neglected. They look to be very friendly and affectionate. Love your shot, it is fun. Ha, I can picture you throwing the apples over the fence. Such a sad plight for these horses. Who owns them? Cute. I love how close you got! Great nose shot. Very sad story. Great there are so many caring people around!! Oh my what a wonderful shot...he is totally gorgeous & I love all the detail around his mouth & nose. Such a sad story , but that's good news that there are people who do care & willing to help. Fabulous focus here - love your pov. The picture that is, not the story behind it! If this were here theses people would probably be cited for cruelty to animals, possibly arrested. PETA, People for the Ethical Treatment of Animals would definitely be involved. I wonder re cropping a bunch off the right so the mouth, eye, and ear become the shot? Great shot Pam, but what a sad story behind it. Why on earth can't the RSPCA seize the horses and prosecute the owners? Sounds like they know about this animal abuse. Not acceptable!! I have a strong suspicion the animal rights people would swing into action pdq here. Fabulous POV, and a perfect caption. The narrative is really moving -- those poor horses! But your image is hysterical!! Let's just prey it all works out well for them! Glad there are people like yourself willing to help out! Fav for the gorgeous shot. I love the pic but deplore the circumstances which drew you to be there. 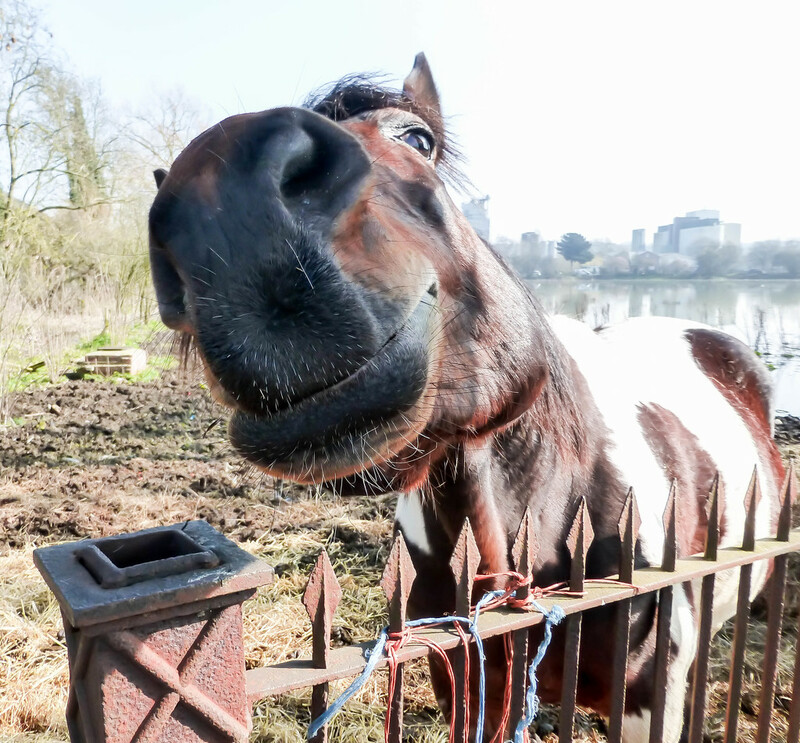 What a fun shot of this slightly cheeky horse! Nice one.